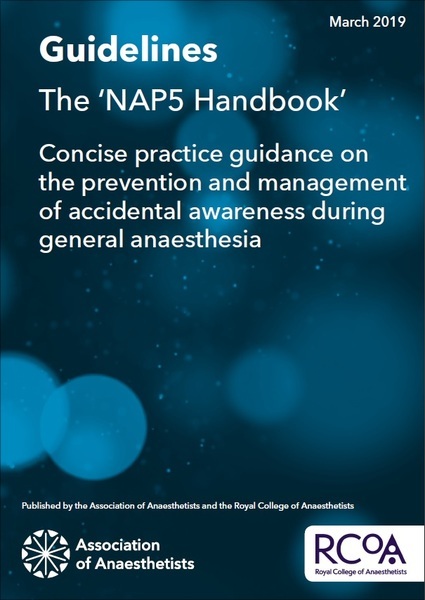 The 5th National Audit Project (or NAP5) of the Royal College of Anaesthetists and Association of Anaesthetists was the largest ever study into accidental awareness during general anaesthesia (AAGA). Numerous publications emerged from the project and whereas a comprehensive list of 64 recommendations were made, the full report and associated publications were primarily academic outputs not accessible to all practitioners as a day-to-day ready reference, nor did they provide practical recommendations that individuals could use in their daily practice. The purpose of this publication is to distil and interpret the findings of the 5th National Audit Project into actions that individuals (and organisations) can follow to reduce the risk of accidental awareness. If AAGA is suspected during maintenance (e.g., by patient movement), prompt attention should be paid to giving verbal reassurance to the patient, increasing analgesia, and deepening the level of anaesthesia. None. Although the NAP5 Report made 64 recommendations, these were presented as conclusions of a large scale academic enquiry and do not constitute any form of practical practice guidance. Otherwise, scattered in the world literature within individual studies relating to AAGA are reasonable suggestions for practice, but these have never been brought together within one national guidance document to form a coherent source of advice. 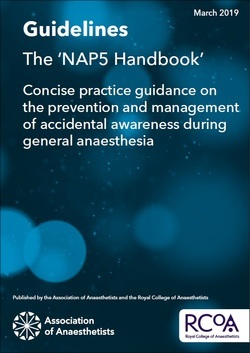 During the dissemination phase of NAP5 it became clear to the NAP5 team and its sponsoring organisations (the Association of Anaesthetists and Royal College of Anaesthetists) that more concise and focused guidance was needed, addressed to anaesthetists facing common problems related to AAGA. It was recognised that, while the intellectual and scientific justification for new ways of working had been presented in a rigorous way by NAP5 within a very large document and a series of publications, this of itself was not useful practice guidance. How and why does this guideline differ from previous ones? First, unlike almost any other guidance on AAGA, this guideline emphasises the overriding importance of NMBDs in increasing the risk of AAGA. Other patient risk factors are acknowledged, but advice on managing NMBDs incorporates and extends evidence obtained by NAP5. Second, no previous guidance addresses how to approach consent for general anaesthesia and sedation. This guideline offers forms of words which practitioners can use as a template and adapt for a range of common situations. Third, this guideline presents a precise approach to emergence and reversing NMBDs that has previously not been clearly articulated (but which is based on evidence acquired and presented by NAP5). Anaesthetists, the Association of Anaesthetists, the Safe Anaesthesia Liaison Group and the College of Anaesthesiologists of Ireland.